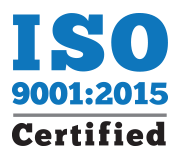 manufacturing – Anderson Automatics, Inc.
AAI is proud to announce our ISO 9001 standard certification renewal from ISO 9001:2008 to the newly revised standard, ISO 9001:2015. ISO 9001 is the world’s most widely recognized quality management standard and helps organizations to meet the expectations and needs of their customers. As part of the ISO 9001:2015 certification process, AAI engaged in a rigorous audit of our business processes as well as our product quality environments.